This yummy Pumpkin Pie Shake is the perfect way to use up leftover pumpkin pie. Combine ice cream, milk and pie in blender. Pulse to blend. Keep in freezer if not serving immediately. When ready to serve, stir and scoop with a big spoon into mugs. serve with a dollop of whipped cream, a drizzle of caramel sauce and a small piece of pie as a garnish. 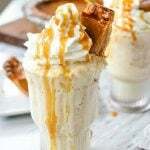 Pumpkin Pie Milkshake was originally written by Leigh Anne Wilkes at https://www.yourhomebasedmom.com/pumpkin-pie-shakes/.